Tag Line: "A nation at his mercy!" 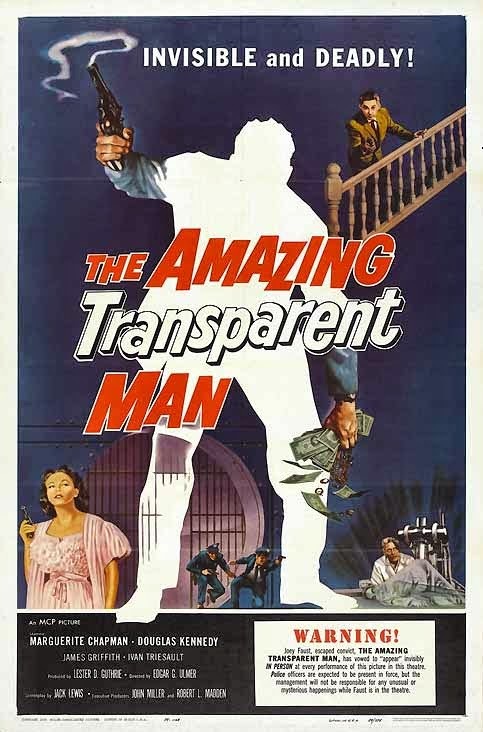 From the title alone, you’ think Edgar G. Ulmer’s The Amazing Transparent Man was a sci fi-heavy motion picture. But in reality, the movie has more in common with the film noirs of the ’40s and ‘50s, filling its story with less-than-admirable characters who would sooner stab each other in the back than work together. The movie kicks off with a jail break. Joey Faust (Douglas Kennedy), a convicted bank robber, scales the walls of his prison and, once on the other side, meets up with Laura Matson (Margeurite Chapman), who’s waiting in a nearby car. Though happy to be a free man, Faust can’t help but wonder who it was that arranged his escape. His curiosity is satisfied when Ms. Matson drives him to a secluded farmhouse, where he’s introduced to Major Krenner (James Griffith), a former military man who, for years, has been working on a device that will make any living creature invisible to the naked eye. Built by German scientist Paul Ulof (Ivan Triesault) against his will (Krenner secured Ulof’s help by kidnapping the scientist’s daughter), the device has been successfully tested on animals, and now Krenner believes it’s ready for a human subject, which is where Joey Faust fits into the picture (who better to experiment on than an escaped convict with nowhere else to go?). Sure enough, the process is a success, and an invisible Faust is sent to steal radioactive material from the U.S. Army, which can then be used to perfect the invisibility machine. Things take an unexpected turn, however, when Faust decides to return to his old ways, using his new-found advantage to knock off a bank instead. Like a film noir, the majority of the characters in The Amazing Transparent Man have a dark edge to them. Even the scientist Ulof, who comes across as the movie’s most sympathetic character, admits to having conducted human experiments during World War 2, at which time he was stationed at a concentration camp. Throughout much of the film, we watch these people try to gain the upper hand on one another (originally promised $1,000 for every canister of radioactive material he swipes, Faust strong arms Krenner, demanding $25,000 per trip instead), and even Laura Matson, who at first we think is Krenner’s partner, attempts to swing a deal with Faust, only to be slapped around when Krenner catches wind of it. While The Amazing Transparent Man isn’t devoid of sci-fi, the scenes featuring it are among the weakest in the film, with special effects that are shoddy at best. But even though the movie falls well short of a science fiction masterpiece, its noirish elements are well-handled, making The Amazing Transparent Man, at the very least, a mildly diverting crime thriller.